Eat. Drink. Listen Closely. Formerly The Melting Point, The Foundry live music venue is a blend of old and new: vintage modern decor in the oldest building on the Graduate Athens property. A 30 foot smoke stack anchors the venue's entry tower while three glass and metal garage doors blend the exterior patio with the interior space for al fresco dining and listening in pleasant weather. Savor, sip and socialize in style with a mix of locals and travelers alike an atmosphere like no other. 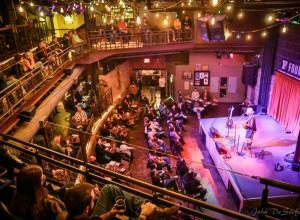 This intimate music venue hosts a variety of music styles and is a favorite of a wide range of fans. Click on the Calendar tab above for upcoming performances, or see The Foundry at their website for full details and tickets.The Foundry offers a diverse menu of lighter fare, entrees and desserts that will tempt anyone’s taste buds.